Marlowe befriends a down-on-his-luck war hero roaming the streets of California. A few months after Marlowe cleans him up and sets him on his way, the man is standing on Marlowe’s doorstep, holding a gun and asking for a ride to Mexico. While Marlowe refuses to hear out the reason for this request, it’s revealed that the man’s wife has been murdered and it may or may not be by his new friend’s hand. With those rather shady circumstances still hazing over his head, Marlowe is approached by a publisher asking for his assistance in figuring out just what exactly is throwing their prized writer off his rocker. Marlowe initially disagrees but before long, he’s pulled in by the author’s stunning wife. Can Marlowe narrow down the reason for the writer’s madness? Are the two cases connected? Is Marlowe in over his head? 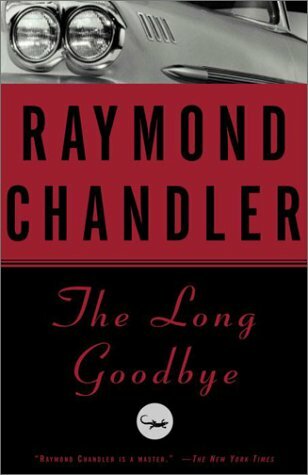 While there’s still another novel to follow (Playback), The Long Goodbye is widely considered Raymond Chandler’s swan song to arguably literature’s greatest detective. Often cited as the gold standard in crime fiction, The Long Goodbye snapped up the Edgar Award for best novel in 1955, is listed on countless “best of” compilations and has influenced a generation of mystery and crime writers. Chandler wrote The Long Goodbye during a very difficult time in his life. His wife was terminally ill and he was suffering from bouts of depression and alcohol abuse. It’s been noted that a few of the characters in the novel were used as a way for Chandler to clear his mind. He used them to express his innermost thoughts on the state of society, his frustrations as a writer and his internal struggle with whether or not he should commit suicide. It’s been said before – by myself and others – that the plot in Chandler’s Marlowe novels can almost be considered secondary to the author’s writing. As usual, Chandler is in top form here as he calls out society’s apathetic trend, the hypocrisy of the police force and the power of money. There’s so much to love about this novel and in my opinion, it’s the finest of the series. Given the circumstances surrounding its creation, it’s hard to ignore the personal nature of the writing. At heart, both Chandler and Marlowe are very cynical people and Marlowe literally offends every person he comes into contact with. I suppose that’s nothing new but it reflects Chandler’s state of mind at the time. You almost wonder if Marlowe couldn’t care less whether he lives or dies at the end of the day. He’s a solitary individual who could give a damn what you or anyone else thinks of him, all that matters is the truth. That’s a very dangerous man and that’s the best kind of detective. September 13, 2014 in Fiction, Raymond Chandler.